You enter the chapel, built in 1863 and dedicated in 1870, through the 1906 entryway. On either side, you see memorials to those benefactors whose generosity has not only sustained the chapel over a century and a half, but has embellished it. Soft light filters into the chapel through Meyer's 1908 and 1931 stained glass. New stenciling, recalling the stenciling present in the first 75 years of the chapel, frames the windows and accents the new oak wainscoting throughout the chapel. Your attention is first drawn to the new marble altar of sacrifice, the new Shrine of the Blessed Sacrament, and the restored murals. 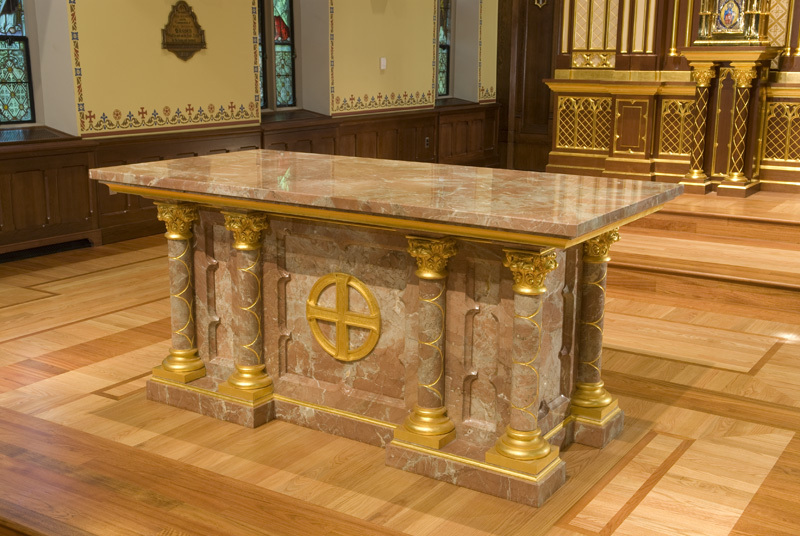 The altar of coralline red marble is enriched with gold leaf accents. In its center is a Greek cross with flared ends superimposed over a circle that represents the globe. Such a cross over a circle symbolizes the rule of Christ over the world. It is inspired by a similar cross that was in the center of the 1931 terrazzo floor uncovered during restoration work and now covered again by the new oak and jatoba wood sanctuary floor. To the right of the altar hangs the sanctuary lamp. According to an inscription commemorating the 1947 renovation, the lamp is part of the original furnishing of the chapel. This beautiful silver gilt lamp has reminded generations of visitors of the presence of the Blessed Sacrament in the chapel since 1863. 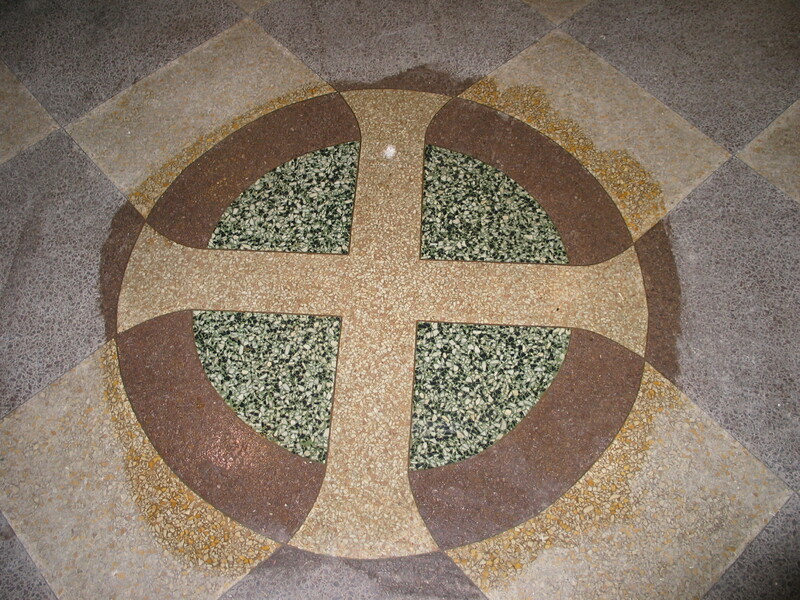 The cross in the terrazzo floor of 1931 uncovered during renovation. The cross from the floor replicated on the altar. 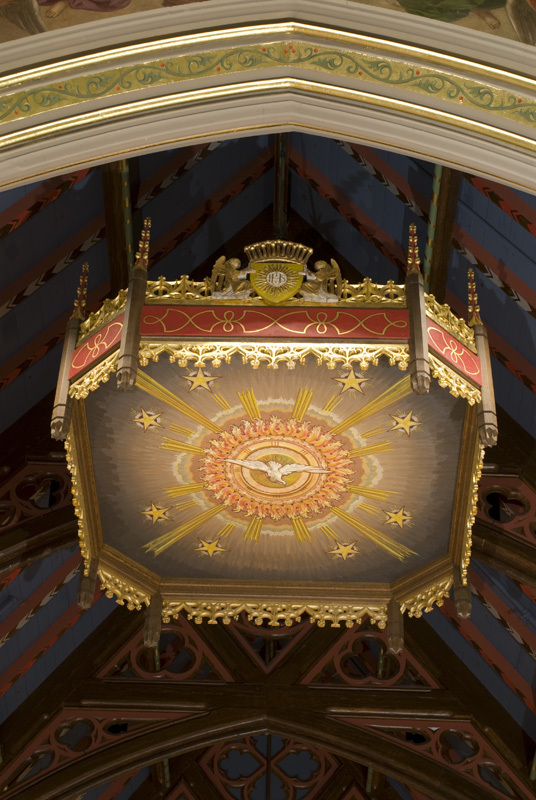 Above the altar is the restored 1947 baldachin depicting the Holy Spirit in the form of a dove. The front of the baldachin shows angels wearing dalmatics on either side of a shield containing a host ensigned with the letters "IHS," the first three Greek letters of the Holy Name of Jesus. Above the letters we can see a small cross and below three nails recalling the crucifixion. 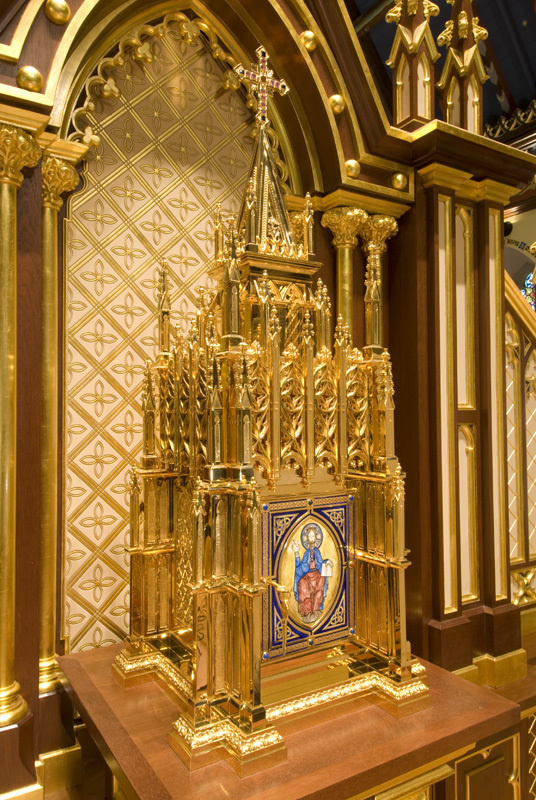 The Shrine of the Blessed Sacrament, fabricated of carved mahogany in the Gothic style with gold leaf accents provides an appropriate setting for a magnificent gilt Gothic tabernacle. The tabernacle is reminiscent of the spire of a Gothic church. 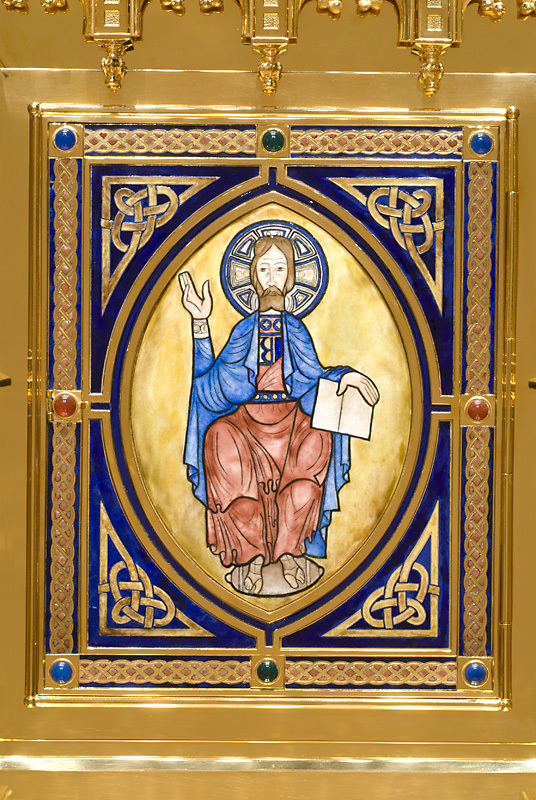 The tabernacle door is enriched with an enameled panel depicting Christ in majesty. On the side walls of the sanctuary are two memorial plaques from the nineteenth century commemorating very early benefactors. Their return to prominence keeps faith with benefactors of the past. Central to the mural on the sanctuary wall is the depiction of the Immaculate Conception by Ferdinand Beraldi in 1906 and transformed by Gonippo Raggi in 1931. Below the mural is the restored 1947 oak paneling embellished with shields of the symbols of the Twelve Apostles. 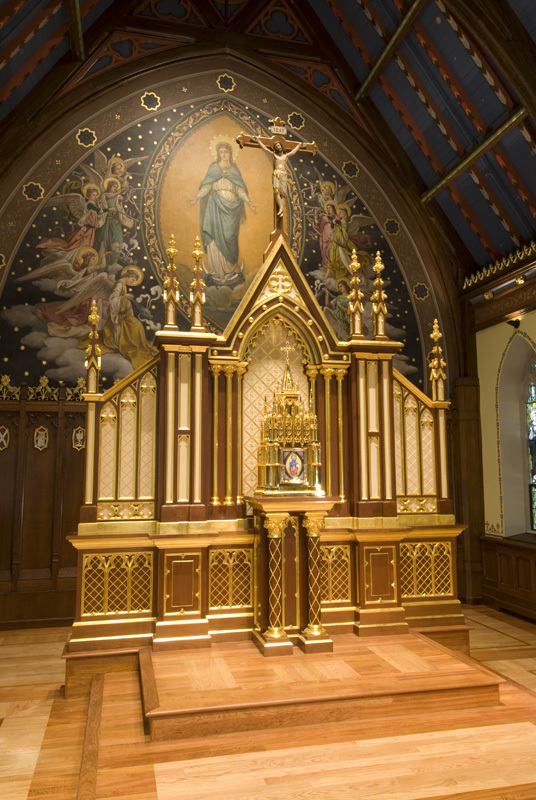 Part of the paneling is hidden by the Shrine of the Blessed Sacrament. 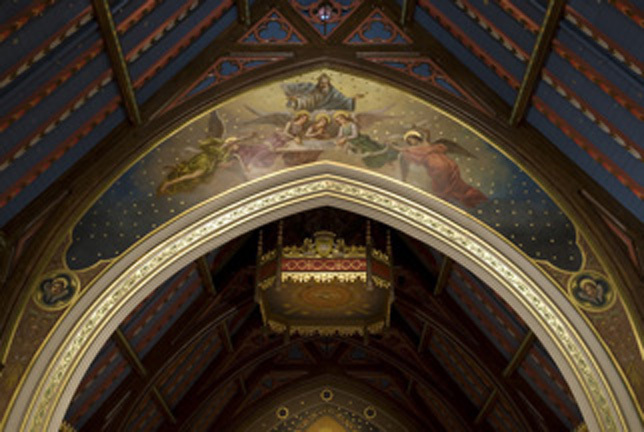 Three shields have been added in the 2008 restoration: shields of Seton Hall University, the Bayley family, and the Seton family. Immediately above on the sanctuary arch, you see Raggi’s 1931 mural of God the Father as He looks over five angels bearing a scroll. The words should read “Regina Sine Labe Originali Concepta Ora Pro Nobis.” However, Raggi used the Italian word “Concetta” instead of the Latin word “Concepta.” The words translate as “Queen Conceived without Original Sin, Pray for Us.” Raggi occasionally made similar mistakes in his other paintings. For example, he renders the motto of Bishop O’Connor under his coat of arms in St. Patrick’s Pro-Cathedral in Newark as “Sapienza Deorsum” rather than “Sapientia Deorsum,” again transposing Italian and Latin. On either side of the sanctuary are the Shrines of Our Lady and St. Joseph. The statue of Mary is polychrome carved wood in the Gothic style. It depicts Mary offering Jesus, her son, to the world. The statue of St. Joseph, in the same style, depicts St. Joseph showing a scroll to the Child Jesus. On the scroll, in Hebrew, are words taken from Psalm 40, verses 8 and 9: "Then I said, 'Behold, I come. In the roll of the book it is written of me: I delight to do your will, my God, and your law is in my heart.'" The backgrounds of the shrines, carved mahogany decorated with pillars and arches, are typical of the Gothic style and similar to the painted background of the side altars in the chapel in the nineteenth century. See photos. The restored chapel from the entrance. Immediately in front of the shrines are portions of the original 1863 altar rail. The remainder of the altar rail was discarded in the 1972 renovation. The altar rail is wood and decorated with wrought iron scrollwork in the form of grape vines and leaves. We see echoes of the 1863 decoration in the details of the corbels "supporting" the sanctuary arch. It is a rich sculpture of oak leaves and acorns, perhaps reminiscent of the oak trees that still grace the campus. New gold leaf makes them stand out once again. The great arch of the sanctuary itself has been embellished with gold leaf and stenciling. As we look around the entry, we see new oak paneling decorated with Gothic arches along the rear walls of the chapel. On the left there is a door for the new room for the celebration of the Sacrament of Penance, the Reconciliation Room. On the right the paneling hides the stairway to the organ loft. Directly to the right is the restored Mother Seton Shrine. In 1963 this chapel replaced the Chapel of the Sacred Heart, which in 1906 had replaced the original entry way. 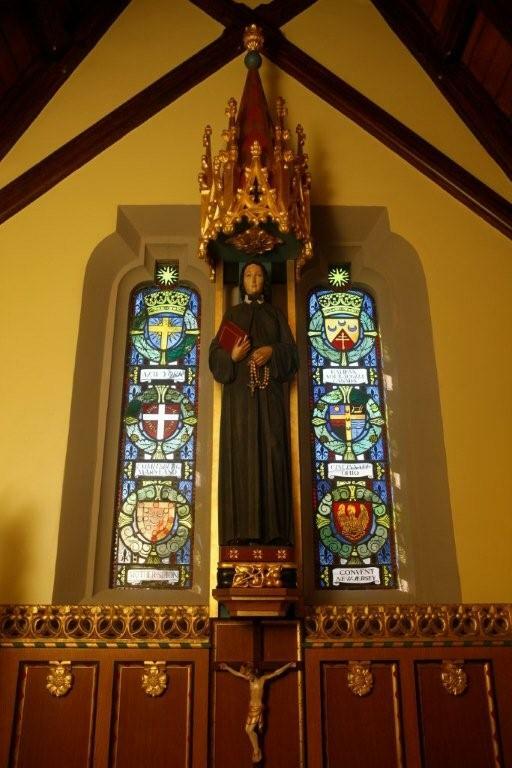 The Mother Seton Shrine depicts St. Elizabeth Ann Seton, canonized on September 14, 1975, in the habit she designed for the congregation she founded, the Sisters of Charity. The stained-glass windows, also installed in 1963, show the coats of arms of the six congregations that trace their origin to St. Elizabeth Ann Seton. As we enter the chapel, we see new oak wainscoting throughout. Above the wainscoting is stenciling with a leaf, rose, cross, and fleur-de-lis motif. The stenciling also forms a frame for the restored stained-glass windows of 1908. Along the walls, the fourteen Stations of the Cross, designed by Raffl of Paris in 1931, have been restored to their original form and color. Raising our eyes to the ceiling, we see a sky-blue ceiling with silver stars. Many churches through the centuries, particularly the medieval period, used this motif to remind worshippers that their ultimate journey is to join the Lord in heaven. As we proceed further into the chapel, our attention is drawn to an elaborate coffin-like memorial on the right side. It is a memorial to the Seton Hall College registrar and four students who died during the 1860s. The memorial is wood with accents in colors. The five memorial plaques are bronze with enamel lettering. On the left side, immediately opposite is a similar memorial to Benjamin Savage. Placed in the chapel in 1933, it commemorates the bequest of $50,000 by Savage, the college handyman. The beauty of the chapel is accentuated by a new lighting system. The new illumination, utilizing current technology, is much more efficient and effective. The new sound system is almost invisible. Great care was taken to integrate the speakers into the color scheme to make them less intrusive. Almost unseen, a sprinkler system was installed and the pipes are blended into the ceiling. The sprinkler heads appear to be among the stars on the ceiling. Archbishop John J. Myers celebrating the Mass re-dedicating the Chapel. Our university chapel, more beautiful than ever, is a wonderful combination of the original, the old, and the new. The original fabric, exterior and interior, has been restored. The Gothic Revival style has been faithfully conserved. The donors of the past are honored as portions of previous campaigns have been preserved and restored to their original glory. 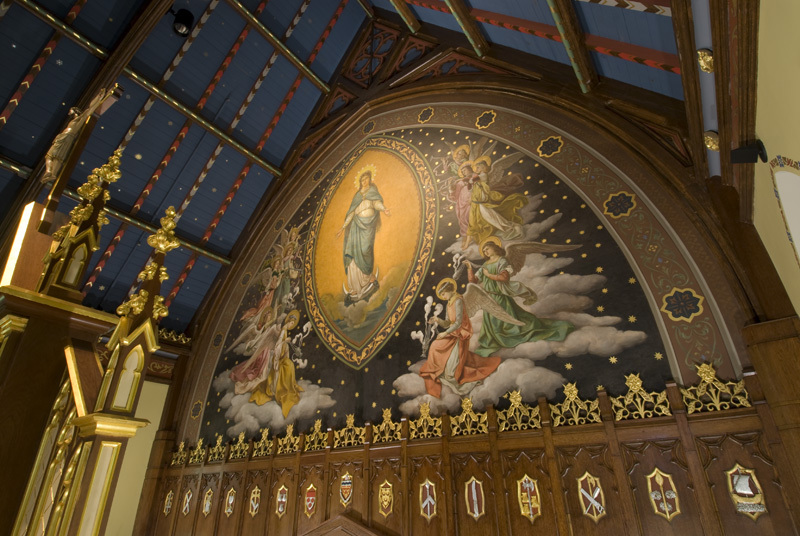 The benefactors of the current restoration can be proud that the Chapel of the Immaculate Conception will be a place of worship, more magnificent than ever, for future generations of Setonians. I am grateful to Michael Marconi of Facilities Engineering, Evergreene Studios, and Seton Hall Public Relations for providing photographs for this site. I also am grateful to Vincent Nalupta and the Teaching, Learning and Technology Center staff for their assistance in completing this site.